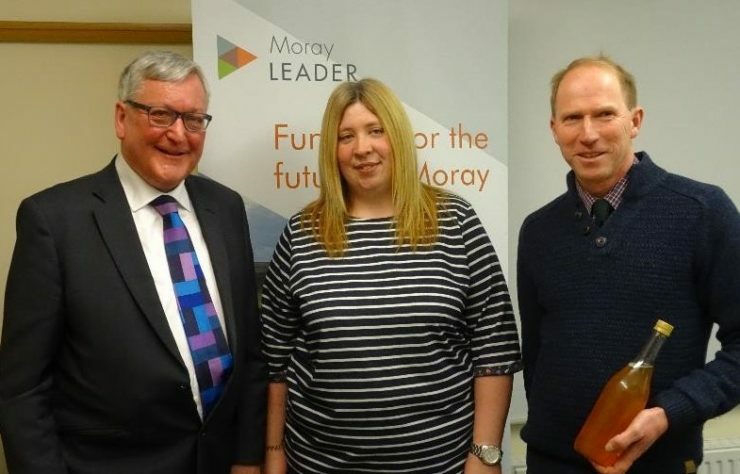 The latest projects to be awarded funding under the Moray LEADER Programme have been announced during a visit to Moray LEADER by Fergus Ewing, Cabinet Secretary for the Rural Economy and Connectivity. Two projects have been successful in their applications, amounting to an investment of around £105,000 awarded funding in the economic and community development of Moray. The two projects include an innovative mobile apple juice production enterprise and the redevelopment of Keith’s ‘much-loved’ skatepark, providing a safe and accessible recreational space for local young people to use. Elgin’s Orchard Ltd has been awarded funding to process apples and other produce into juice. The award will cover the cost of machinery to handle, wash, crush and press fruit and vegetables and to pasteurize and bottle the juice and label the bottles. The operation is based at Kirkhill Farm, Elgin but the machinery will be installed on a trailer pulled by a 4x4 vehicle, allowing a juice making service to be offered around Moray and North East Scotland. Keith Rollerbladers, BMX and Skateboarders – better known as KeRBS – have been awarded funding of £24,040.93 towards the redevelopment of their skate park in the Cuthil Park area of Keith. The project provides a safe and accessible space for local young people to use, providing outdoor recreational leisure and service provision that supports them to gain social skills and confidence in a sport they are passionate about. The award will cover 62.4% of the total eligible project costs.